The building of the University of Warsaw Library is fully adapted to the needs of physically disabled users. The library has rooms and facilities to help blind and visually impaired persons, as well as people with mobility impairments, use BUW resources or their own materials. a Braille line: CombiBraille TIEMAN 85 (1 item). Two of the above individual booths have a soundproofed interior (covered with acoustic screens) without access to daylight (with the possibility of lighting them with artificial light). Moreover, in the BUW Open Stacks near the Main Reading Room there is: an enlarger: Enchanced Vision (MRVE 24D model) (1 item). Persons who wish to use specialized equipment, in particular specially adapted computers and equipment of the individual booths, are asked to document their needs for using the facilities in the Office for Persons with Disabilities . Computer access passwords and keys to booths will be made available only to persons having authorization issued in the Office for Persons with Disabilities at the University of Warsaw. Authorization can be obtained by all BUW users, not only students and UW employees, if it is necessitated by their state of health. The Academic Digital Library is a project initiated by the Office for Persons with Disabilities at the University of Warsaw in 2012. It was created by transforming the Talking Book Library, founded in 1998. It provides services of preparing, gathering and giving access to collections for students, employees and unenrolled students of tertiary education institutions whose disability prevents their use of standard printed materials. The library collections are divided into three categories: “Books”, “Magazines” and “Other documents” which may be outlines, presentations and non-book or magazine publications. At present the library counts several thousand collections and their number is systematically increasing. The catalogue can be searched without logging into the website by giving basic criteria: title or author. It is also possible to search by the contents, bibliographic description or terms. The ABC service is available not only to disabled students and employees of the University of Warsaw, if their state of health necessitates it, but to every person who has documented the need to use it. Depending on the place of residence, such authorization can also be obtained from one of the partner universities. Several other Polish universities are involved in the project of the Academic Digital Library, apart from the University of Warsaw. These are: the Stanisław Moniuszko Academy of Music in Gdańsk (phone: (58) 300 92 46), Pomeranian University in Słupsk (phone: (59) 840 59 40), Andrzej Frycz Modrzewski Krakow University (phone: (12) 252 44 13), the State University of Applied Sciences in Płock (phone: 501 271 688), Łazarski University (phone: (22) 543 53 90), Maria Curie-Sklodowska University in Lublin (phone: (81) 537 58 90), Adam Mickiewicz University in Poznań (phone: (61) 829 37 89), The Jan Kochanowski University in Kielce (phone: 41 349 71 70), the Jagiellonian University in Cracow (phone: (12) 424 29 61), Kazimierz Wielki University in Bydgoszcz (phone: 523 461 175), Siedlce University of Natural Sciences and Humanities (phone: (25) 643 17 73), SWPS University of Social Sciences and Humanities in Warsaw (phone: (22) 517 96 33), the University of Warmia and Mazury in Olsztyn (phone: (89) 523 38 66), the University College of Enterprise and Administration in Lublin (phone: (81) 740 84 83), Stanislaw Staszic College of Public Administration in Bialystok (phone: (85) 732 12 93), Collegium Civitas University in Warsaw (phone: (22) 656 71 82). The ABC services desk is located in the BUW Open Stacks on Level 2 by the Didactic Collection, next to room 264, (email: biblioteka.bon@uw.edu.pl, phone: (22) 55 25 383). The ABC services desk is open from Monday to Friday, 8-15. To a large extent the functioning of the ABC website is based on the actions of people of good will who devote their free time to support others. Therefore, we invite you to cooperate – to support people whose disability prevents the use of materials in ordinary print. To provide them with free access to materials, we are looking volunteers. You do not need to know the technology of converting paper materials into a digital form – we provide training and assistance. We offer a certificate of completed voluntary work or student internship. phone: (22) 55 25 383. Limitations on borrowing outside of the Library (Chapter III, clauses 49.1, 2, 4, 5 and 7 of the BUW Regulations) may be suspended for a definite period in relation to persons with disabilities, after they have been authorized by the Office for Persons with Disabilities UW. This applies to works from the open stacks marked with a red sticker or a dot and from reference collections of reading rooms and library departments, encyclopedias, dictionaries, bibliographic publications or any other publications of reference character, periodicals and books published before 1950. In order to borrow them you have to fill in a traditional order slip (available at the Information Desk). To collect ordered books at the Circulation Desk please present the authorization. take part in a guided tour of the Library. Please book in advance: room 141, phone: (22) 55 25 181, e-mail: informacja.buw@uw.edu.pl. 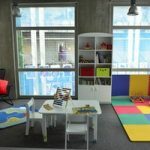 BUW playroom is a separate room for parents with children, where they can learn and work with the book collection from the Open Stacks. There is special space to play and with books for children. In the BUW playroom there is also a feeding and baby-changing corner. The BUW playroom is located on level 1 next to the lift, on the side of the Information Desk. Open during the library opening times. Please collect the key at the Information Desk. The sponsor of the playroom equipment is the company Meblik Sp. z o.o. The reading room is subject to the regulations and safety regulations of the University of Warsaw Library. Work stations in the reading room are dedicated solely to the readers with children. The carers of a child are responsible for the safety of the child in the reading room. A child cannot remain in the reading room unattended by an adult. Books and periodicals brought to the reading room from the open stacks shall be placed on the trolley outside the reading room after finishing work. The carers are liable for damage caused while using the reading room. No elements of the equipment, toys or children’s books can be taken away from the reading room. Used hygiene products (nappies, baby wipes etc.) must not be left behind in the reading room. 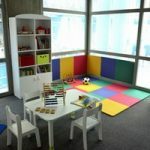 The reading room, especially the space for children to play, should be kept clean. Any comments regarding the use of the reading room (eg damage, dirt, etc.) should be reported to the Information Desk.